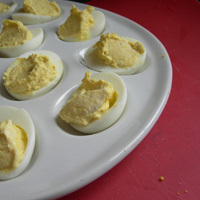 Ever since I can remember, we've had deviled eggs at every holiday or major celebration dinner in my family. They make the holiday, so it was my greatest honor to get my first married dinner assignment: bring the eggs! On the big day? Disaster. I had three dozen boiled eggs sitting in a pot, and those peels were not coming off. I ended up with a pile of peels stuck to egg chunks. I cried a little. So here are the results of the last ten years of my egg study: Only devil fresh eggs. The peel comes off and no bystanders get hurt. I don't want to endorse a store, but I have found that Wal-Mart's eggs peel the easiest. It doesn't make sense, but it's the truth. You can also test your eggs by dropping them in water. If they are fresh, they should sink. 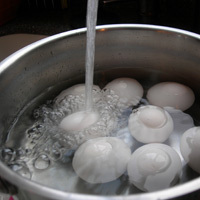 Spoiled eggs float, and then there are various stages of floating and sinking as the eggs age. Eggs that totally sink are about 3 to 6 days old, and if it floats at an angle, it is more than a week old but may still peel well. One last tip: Don't agree to devil three dozen eggs, even if the eggs are fresh. Think: hours. Pour cold water over 8 eggs, add some salt, and bring to a boil. 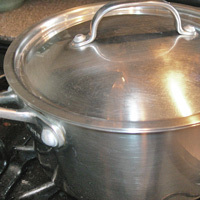 Turn the heat off, cover, and let steam for 15 minutes. This cooks the eggs gently and keeps the yolks from turning grey. Run cold water over the eggs and peel immediately. The longer they sit, the harder they are to peel. Peel eggs from the larger end and work down to the narrow end. It just works. Trust me. 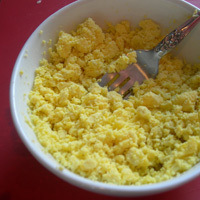 Using a fork, crumble the yolks, then sprinkle with salt and pepper (somewhere between a dash and a 1/4 t of each). Add 1/4 c mayo and 1/2 t mustard and mix. Do a taste test and then add up to 2 more T of mayo. Serve immediately or refrigerate for up to 6 hours. If you are going to make them a day ahead, assemble day of and keep covered. Relish is optional: Usually I love to have a 'secret' ingredient--A little white wine, some vinegar, or even tuna fish. Don't be swayed. When it comes to some southern dishes, the way my Mom taught me is still the best. You can't mess with perfection. Pickle Relish is okay if you're into pickles, but it has to be sweet relish and not dill, or my Grandmother will come hassle you. 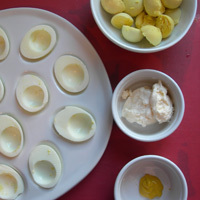 Dry eggs: Make sure the filling isn't too dry. Just taste it once or twice (or three times) to make sure the taste is right. No flavor: If there isn't enough salt or mayonaise, the filling is bland. I never add more mustard, though. It can easily overpower the egg. Adding fancy ingredients: Usually I love to have a 'secret' ingredient--A little white wine, some vinegar, or even tuna fish. Don't be swayed. When it comes to some southern dishes, the way my Mom taught me is still the best. You can't mess with perfection. Pickle Relish is okay if you're into pickles, but it has to be sweet relish and not dill, or my Grandmother will come hassle you. 1. Pour cold water over 8 eggs, add some salt, and bring to a boil. Turn the heat off, cover, and let steam for 15 minutes. This cooks the eggs gently and keeps the yolks from turning grey. 2. Run cold water over the eggs and peel immediately. The longer they sit, the harder they are to peel. 3. 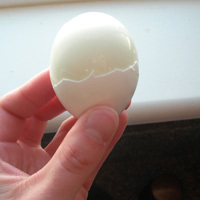 Peel eggs from the larger end and work down to the narrow end. 5. Using a fork, crumble the yolks, then sprinkle with salt and pepper (somewhere between a dash and a Â¼ t of each). 6. 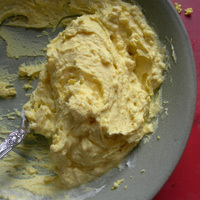 Add Â¼ c mayo and Â½ t mustard and mix. Do a taste test and then add up to 2 more T of mayo. 7. Serve immediately or refrigerate for up to 6 hours. If you are going to make them a day ahead, assemble day of and keep them covered until you are ready to serve.